Billbergia nutans is one of those plants that will persist in a coastal garden for years with little if any care. And in spite of that negligence the Friendship Plant blooms like this. Of course you can take a little better care of it and the Queen's Tears really deserves its name. 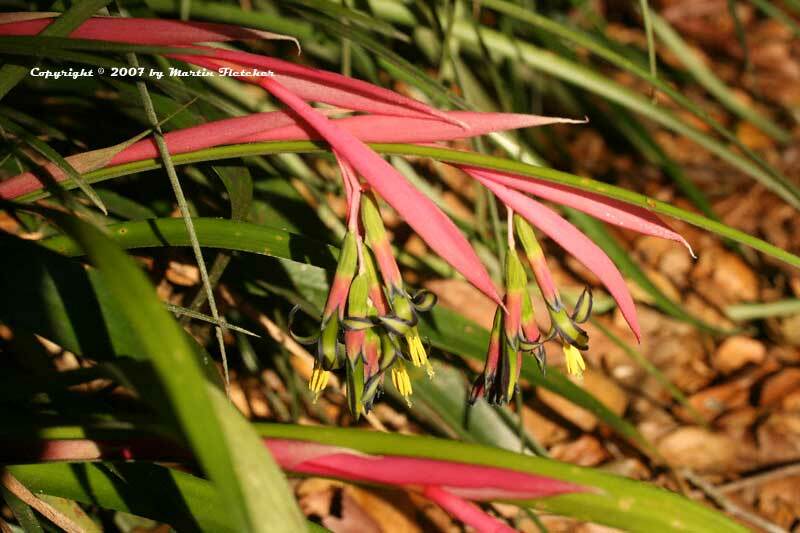 Billbergia nutans will do its best in a high shade garden, with a moderate amount of moisture. Like most of the Bromeliads these collect water between the leaves, and like overhead water and lots of organic material. Billbergia nutans will survive temperatures into the teens, but will look awful for most of the following year. Best if you Queen's Tears doesn't get chilled past the mid-20°s F.
Flowers and foliage of Billbergia nutans the Queens Tears or Friendship Plant. High resolution photos are part of our garden image collection.